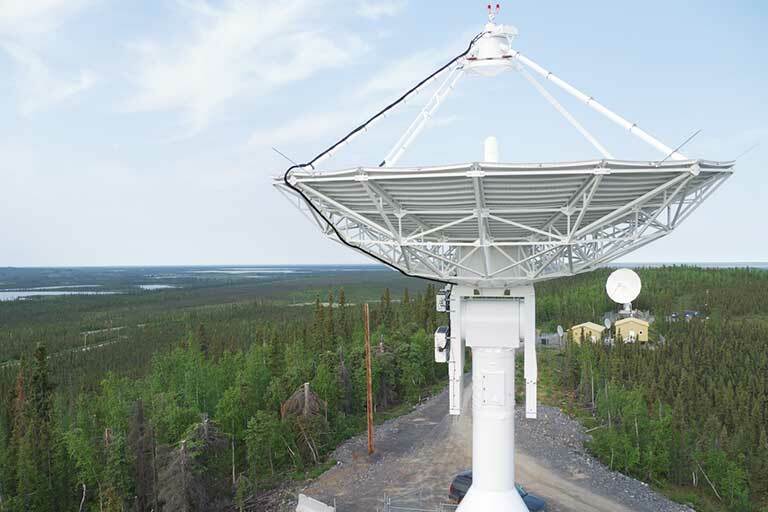 The Inuvik Satellite Station currently houses two SSC-owned 13-meter antennas and full integration with two equivalent partner antennas for Telemetry Tracking & Command (TT&C) and data downlink services. The ground station supports multiple frequency bands including S-Band and X-Band as well as an operational office which houses system electronics and data processing equipment. The station has recently been expanded to increase antenna capacity. The location above the Arctic Circle is particularly advantageous for accessing polar orbiting satellites. The Inuvik Satellite Station is an important node in SSC's global network of ground stations. Its favorable location allows reception of all passes of polar-orbiting satellites. The “Kinuvik” combination - Inuvik plus Kiruna (Esrange Satellite Station) - offers the capability for satellite contacts on all orbits during one day. It also provides the benefit of possible long duration passes which significantly increases the amount of data that can be downlinked from polar-orbiting satellites.